Continue to Support ECI with QSP Purchases! QSP is here! This year our QSP program will be running from September 26th until October 16th just after Thanksgiving (although you can still place an order at any point in the year). This is an easy and fun way to support our kids and their school. 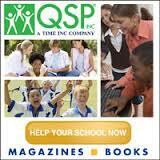 Please support our wonderful school by visiting www.qsp.ca. To begin an order, simply input our unique code (3721750) and browse the magazines subscriptions available for purchase. Please visit the Fundraising Committee Tab on the website to find out more about the program.